When it comes to teaching children, I've always been on the opinion that you have to make it appealing to them. Math in and of itself can be boring, you have to make it exciting...come at it from something they like. When my son was younger, we saw this firsthand with his love of trains. It was through them that he learned his colors, his numbers and even to read! Now that he's gotten a little older, he still loves his trains, but his tastes have evolved a bit as well. Like many boys his age, he's all about the comic books. And it's not just boys HIS age either. Even my husband at 31 years old is all about the comics and graphic novels! To be honest though, my husband is not usually much of a Bible reader. He'll read books on the History of the Bible and religion. He'll watch shows on the same subject. But actually sitting down and reading the Bible? He's not likely to do it. So I was a bit surprised a few years ago when we came across The Action Bible series and he insisted on buying the first...and reading it too! But The Action Bible series was not like any other Bible stories we'd ever seen...it was the story of the Bible...written as a graphic novel! And let's be honest, it WORKS. The Bible really isn't a cutesy little story that is sometimes seen in children's Bible storybooks. It's filled with action and adventure and acts of heroism...everything a good graphic novel should have! So of course when my comic book loving 7 year old became obsessed with Bibles and Bible stories, he took over his Daddy's Action Bible. 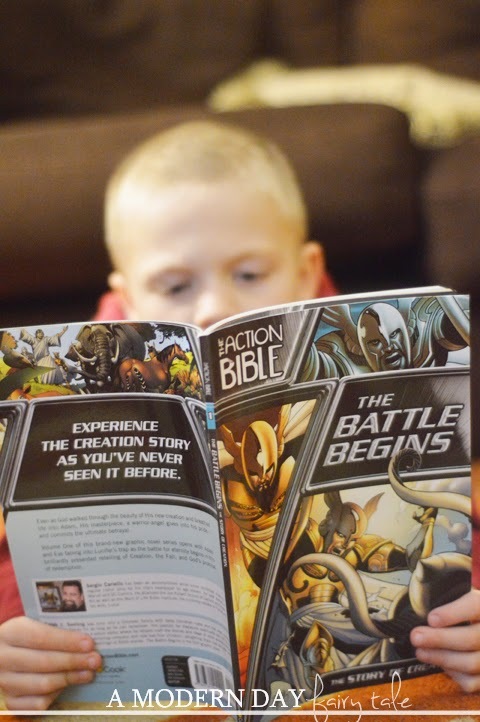 He was thrilled when I was given the opportunity as a Family Christian blogger to review a copy of The Action Bible: The Battle Begins- one of his favorite Bible stories-the story of creation. His response? "Awesome!" A simple word but it about sums it up. It truly is the coolest way to 'read the Bible'. Now my son already likes Bible stories but that's not true for every child. 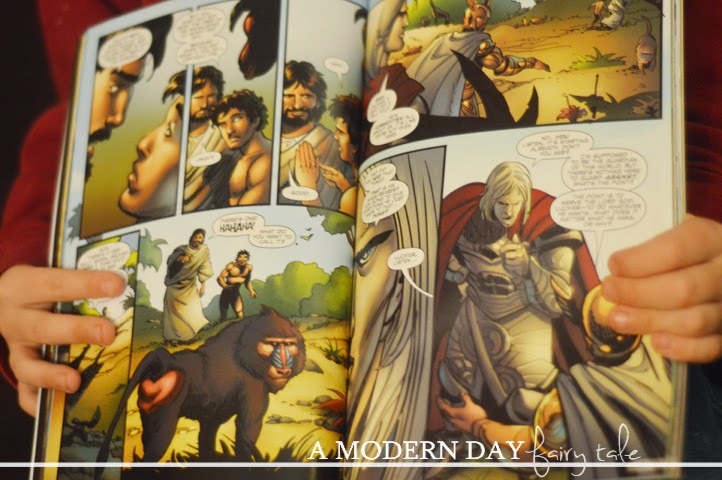 Not only are the Action Bible books perfect for the comic book fans who love Bibles, but also for those who like my husband might not typically be drawn to read it. It makes it interesting and new and most importantly gets kids of all ages excited about the Bible. At the end of the day, isn't that what we should be striving for? For my son, I particularly liked this particular book in the series because not only was it again a favorite story, but in its smaller selection was much more manageable for his small hands, compared to the original his daddy had! I love the crosses at Family Christian and me and my daughter in law can pick out woone we both like. Great choice! I'd love to add a few more crosses to my decor as well! I would love this Action Bible. I have heard great things about it. I have two boys who might just love it!! It's super fun! We love it here! I would like to get a veggie tales DVD, maybe the Beauty and the Beet. I'd probably put it towards the Little People Noah's Ark. What a great gift for a grandchild! So fun! We have the LP Nativity, but Noah's Ark would be super fun! I would probably get the My Pillow Pets Dream Lite - Prayer Lamb for my granddaughter. I love to use certificates from Family Christian to buy gifts for family and friends! Thanks!! They have so many great gift ideas don't they? I'd like to buy some spring decor for my home. It would be fun to decorate for Easter with something other than Easter eggs!